Fusion protein corresponding to Bovine Vimentin. RV202 is a mouse monoclonal IgG1 antibody derived by fusion of SP2/0-Ag14 mouse myeloma cells with spleen cells from a BALB/c mouse immunized with a vimentin extract of bovine lens. IHC-Fr: Tonsilar lymphoma tissue. 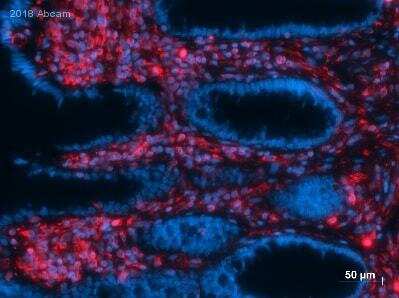 ICC/IF: Cultured bovine lens epithelial cells and wildtype HAP1 cells. Our Abpromise guarantee covers the use of ab8978 in the following tested applications. IHC-Fr Use at an assay dependent concentration. Recommended range is 1/100 - 1/200 for Immunohistochemistry with avidin-biotinylated horseradish peroxidase complex (ABC) as detection. For PFA fixed tissue use at 1/1000. WB 1/100 - 1/1000. Detects a band of approximately 57 kDa. Immunofluorescence staining showing changes in SK-N-SH-lamin-A/C-shRNA compared with SK-N-SH-scramble-shRNA in (A) β-actin filaments, (B) F-actin filaments. (C) Vimentin filaments, and (D) α-tubulin. Lamin A/C is shown in green; β-actin, F-actin, vimentin, and α-tubulin are shown in red.DNA is stained in blue (DAPI). Scale bar, 10μM. Vimentin is detected using ab8978 at 1/100 dilution. Neuroblastoma cells were fixed with 4% paraformaldehyde and permeabilized using 0.5% Triton X-100. ab8978 staining Vimentin in wild-type HAP1 cells (top panel) and VIM knockout HAP1 cells (bottom panel). The cells were fixed with 100% methanol (5min), permeabilized with 0.1% Triton X-100 for 5 minutes and then blocked with 1% BSA/10% normal goat serum/0.3M glycine in 0.1% PBS-Tween for 1h. The cells were then incubated with ab8978 at 1μg/ml and ab202272 (Rabbit monoclonal [EP1332Y] to alpha Tubulin (Alexa Fluor® 594)) at 1/250 dilution overnight at +4°C, followed by a further incubation at room temperature for 1h with ab150117 (Goat secondary antibody to Mouse IgG (Alexa Fluor® 488)) at 2 μg/ml (shown in green). Nuclear DNA was labelled in blue with DAPI. 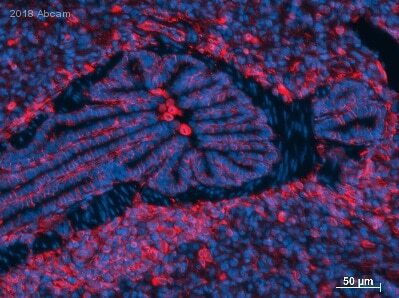 Paraffin-embedded human colon tissue stained for Vimentin using ab8978 at 1/100 dilution in immunohistochemical analysis. Immunohistochemistry (Formalin/PFA-fixed paraffin-embedded sections) - Anti-Vimentin antibody [RV202] (ab8978)This image is courtesy of an anonymous abreview. ab8978 staining Vimentin in Human fetal kidney tissue sections by Immunohistochemistry (IHC-P - paraformaldehyde-fixed, paraffin-embedded sections). Tissue was fixed with formaldehyde and blocked with CAS-Block for 1 hour at 25°C; antigen retrieval was by heat mediation using OmniPrep (pH 9). Samples were incubated with primary antibody (1/500) for 1 hour at 25°C. An Alexa Fluor® 555-conjugated Donkey polyclonal (1/200) was used as the secondary antibody. Overlay histogram showing HeLa cells stained with ab8978 (red line). The cells were fixed with methanol (5 min) and then permeabilized with 0.1% PBS-Triton for 20 min. The cells were then incubated in 1x PBS / 10% normal goat serum / 0.3M glycine to block non-specific protein-protein interactions followed by the antibody (ab8978, 1/100 dilution) for 30 min at 22°C. The secondary antibody used was DyLight® 488 goat anti-mouse IgG (H+L) (ab96879) at 1/500 dilution for 30 min at 22°C. Isotype control antibody (black line) was mouse IgG1 [ICIGG1] (ab91353, 2µg/1x106 cells) used under the same conditions. Acquisition of >5,000 events was performed. This anti-Vimentin antibody gave a positive signal in HeLa cells fixed with 4% paraformaldehyde (10 min)/permeabilized in 0.1% PBS-Triton used under the same conditions. Immunofluorescence staining images of 9 day old zebrafish embryos. ab8978 reacts with in connective tissue cells and bloodvessels. Frozen sample treated with Acetone:Methanol 1:1, antibody diluted 1/100 and incubated for 45 minutes at room temperature. Immunocytochemistry/ Immunofluorescence - Anti-Vimentin antibody [RV202] (ab8978)This image is courtesy of an anonymous abreview. ab8978 were fixed with paraformaldehyde, permeabilized with PBS and 0.5% Triton ×100 and blocking with 0.1% BSA + 10% Goat Serum at 250C for 30 minutes was performed. Samples were incubated with primary antibody (1/250: in PBS, 0.1% BSA and 10% Goat Serum) for 12 hours at 4°C. An Alexa Fluor®594-conjugated goat polyclonal to mouse IgG was used undiluted as secondary antibody. ab8978 staining Vimentin - Neural Stem Cell Marker in Human Colon fibroblasts by ICC/IF (Immunocytochemistry/immunofluorescence). Cells were fixed with methanol, permeabilized in 0.1% Triton and blocked with 0.25% serum free protein blocker for 20 minutes at 28°C. Samples were incubated with primary antibody (1/100 in antibody diluent) for 2 hours at 28°C. ab6785 Goat polyclonal anti-Mouse IgG - H&L (FITC) (1/800) was used as the secondary antibody. Nuclei were counterstained with propidium iodide. ab8978 staining Vimentin in Dog soft tissue sarcoma tissue sections by Immunohistochemistry (IHC-P - paraformaldehyde-fixed, paraffin-embedded sections). Tissue was fixed with formaldehyde and blocked with 15% serum for 1 hour at 20°C; antigen retrieval was by heat mediation in a Tris/EDTA pH9 buffer. Samples were incubated with primary antibody (1/100 in TBS) for 18 hours at 20°C. A Alexa Fluor® 647-conjugated Goat anti-mouse IgG polyclonal (1/400) was used as the secondary antibody. IHC-Fr image of Ed18 rat stained with ab8978. Fresh frozen sections were incubated in 10% normal donkey serum in 0.1% PBS- and 0.3% triton X100 for 1h to permeabilise the tissues and block non-specific protein-protein interactions. The sectons were then incubated with the ab8978 (1µg/ml) and ferroportin overnight at +4°C. 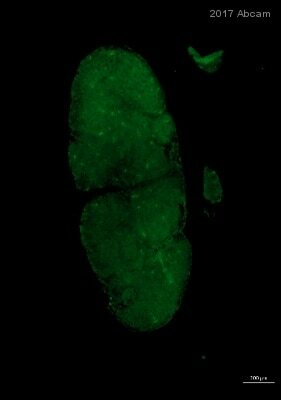 The secondary antibody (green) was Alexa Fluor® 488 donkey anti-rabbit IgG (H+L) used at a 1/1000 dilution for 1h. Alexa Fluor® 568 (red) donkey anti-mouse at a 1/1000 dilution for 1h. DAPI was used to stain the cell nuclei (blue) at a concentration of 1.43µM. Vimentin expressed in the gut muscles. Immunocytochemistry/ Immunofluorescence - Anti-Vimentin antibody [RV202] (ab8978)This image is courtesy of Dr. Ruma Raha-Chowdhury, Cambridge University, United Kingdom. IHC-FoFr image of vimentin staining on rat injured cortical sections using ab8978 (1:500). The brain was perfusion fixed using 4% PFA and the sections were permeabilized using 0.1% TritonX in 0.1% PBS. The sections were then blocked using 10% donkey serum for 1 hour at 24°C. ab8978 was diluted 1:500 and incubated with sections for 24 hours using 4°C. The secondary antibody used was donkey polyclonal to rabbit IgG conjugated to Alexa Fluor 488.
ab8978 vimentin staining of a tonsilar lymphoma. Note that the epithelium (at the left) is negative. ab8978 staining Vimentin in bovine chromospheres by ICC/IF (immunocytochemistry/immunofluorescence). Cells were PFA fixed and permeabilized in 0.3% Triton X-100. The primary antibody (1/500) was incubated with the sample for 16 hours at 4°C. An Alexa Fluor® 568-conjugated goat anti-mouse IgG polyclonal (1/500) ab175473 was used as the secondary. ab8978 staining vimentin in human pancreatic adenocarcinoma cells by immunocytochemistry/ immunofluorescence. Cells were PFA fixed and permeabilized in 0.2% Triton X prior to blocking in 3% BSA for 30 minutes at 24°C. The primary antibody was diluted 1/200 and incubated with the sample for 16 hours at 21°C. Alexa fluor® 488 mouse polyclonal to mouse Ig, diluted 1/300 was used as the secondary antibody. Immunohistochemistry (Frozen sections) - Anti-Vimentin antibody [RV202] (ab8978)This image is courtesy of an anonymous abreview. ab8978staining Vimentin in human lung tissue section by Immunohistochemistry (Frozen sections). Tissue samples were fixed with formaldehyde and blocking with 5% commercially available blocking agent was performed at 370C for 15 minutes. The sample was incubated with primary antibody (1/250) at 370C for 1 hour. A HRP-conjugated Goat polyclonal to mouse IgG was used as secondary antibody at 1/1000 dilution. What is the epitope sequence of antibody ab8978? The exact position of epitope sequence recognized by anti vimentin antibody (clone RV202) is not determined however, the antibody must recognize an evolutionary highly conserved epitope, since it shows a broad spectrum of species cross reactivity (from human to zebrafish). For more information on the evolutionary conserved regions in the vimentin protein I would like to refer your customer to the paper by Herrmann et al (1996) Journal of Cell Science 109, 569-578. Also the antibody does not seem to recognize either the amino- (N-) or carboxy (C-) terminus, since it reacts with the typical vimentin breakdown products that have a more acidic pI than the intact protein and are therefore known to lack about 10 kDa at their N-terminus. Furthermore, a vimentin construct that lacks its C-terminus (amino acids 408-463) is still recognized by the antibody. This information can be found in Krimpenfort et al (1988) EMBO Journal 7, 941-947. I have a question aboutab8978. I found that it is mouse monoclonal and was tested in mouse sample on the data sheet. I thinks that it is theoretically impossible because this antibody have to use anti-mouse IgGas secondary antibody. So it can show high backgroundby non-specific bindingto endogenous mouse IgG especially in case ofIHC. Indeed, a mouse-on mouse staining can be quite tricky; however, it is not impossible. The background will depend on the fixation method ( perfusion fixed tissue vs. normally fixed tissue), on the tissue itself ( eg. kidneys vs. bone) and the experimental settings. One way to make sure to decrease or to completelyerase the background is to block the endogenous mouse IgG with a non- conjugated secondary antibody before you incubate with your target antibody. I would suggest to use a Fab or F(ab)2 fragment antibody in this case as they will bound in a higher density than whole IgG antibodies. https://www.abcam.com/index.html?datasheet=98754 (or use the following: https://www.abcam.com/index.html?datasheet=98754). https://www.abcam.com/index.html?datasheet=6668 (or use the following: https://www.abcam.com/index.html?datasheet=6668). https://www.abcam.com/index.html?datasheet=127055 (or use the following: https://www.abcam.com/index.html?datasheet=127055). 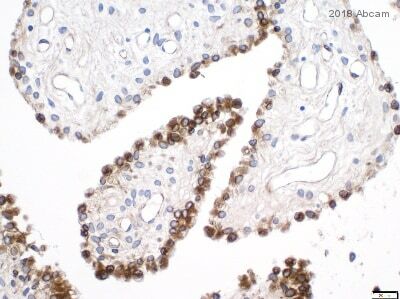 In addition, we also received an Abreview (17 July 2009) from one of our customers who rated this antibody highly in IHC. You can contact the author via our website if you like.